A new month, a new year means new goals... right? I mean goals are good. They give us a destination to work towards. 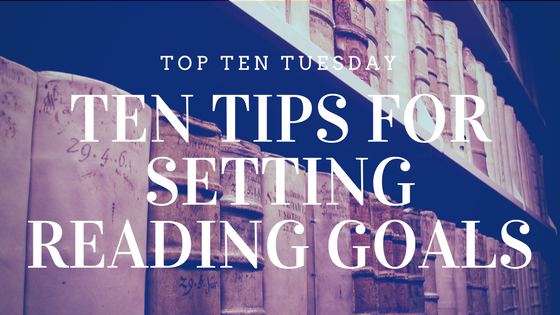 Goals can keeps us from floating adrift in the fast-paced waters of the world. And yet, some goals tend to cause so much stress that they hinder more than they help. How do goals impact you? I have set up my reading goals on Goodreads now for seven years. And I believe I have reached my goal for the last five of those. And for me, I love it. I love to see how far ahead I get of my goal. But I know for some the falling behind stresses out more than helps. 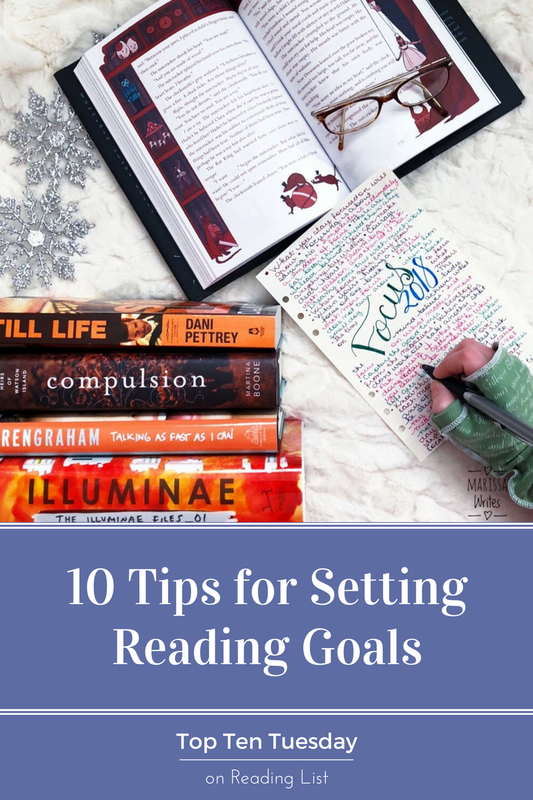 So I was thinking let's chat about reading goals in general today. If you are still struggling with your own goals, feel free to grab a couple of these. I have tried all of them, so I hope they help you. Most of all, remember setting goals for reading are more like setting goals as a distance runner, not an Olympic athlete - it's about your personal best, not getting a metal. Simply Read! Yep, it's an easy goal to start with. If you are the type to keep a planner, put it in your planner - set up a time to read each week, or day, and simply do it. Read anything you want - don't worry about finishing a book... count pages... or simply the days you sat down to read, even if some of those days are only 10 minutes. Try a different medium. If you usually read hardback books, pick up a digital book on a new ereader. Or try an audiobook while you get ready in the morning, or if you can play it through your car speakers using a fun app. Many libraries use Overdrive now, and it is a phone app... Or if you are used to read novels, try some poetry, or a novella. Don't forget about graphic novels for a change of pace. Branch out into a new genre. I'll be honest, this is a hard one for me. But there are so many genres and subgenres. If you are unsure where to spread out to, find a chatty librarian to help... or of course the lovely bibliophiles of goodreads and bookstagram are always good for some recommendations. If you have no idea, check out the genre challenges out there. Find a community. And while I'm on those lovely bibliophiles... find some bookish buddies. It's true peer pressure can be positive... so pick who you spend your extra time with. 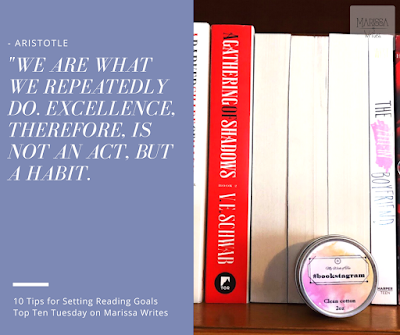 Follow those bookish accounts on facebook, find some friends to chat with on IG in private messages, or even set up a regular coffee date with a friend to simply read a book inside your favorite bookstore and coffee shop! Print out a cute monthly tracker. Then put it near your work station - computer desk, reading nook, kitchen family hub area... anywhere you will see it and engage with it. There are a ton on pinterest, but if you join the Reading List community here you will get the 2018 hand drawn bookshelf in your next newsletter!!! Yay! Join in a Reading Club. Alright this is one that failed me personally because all the actual book clubs in my area seem to only attract retirees who want to read dime-romance novels, or ancient classics... but I know many people have found wonderful clubs. Others start their own. The best part of the Internet is that you could even join a virtual book club and never have to leave your own home for those reading meet ups. Agree to some Buddy Reads. Now this one has worked wonders for those months I don't feel like reading. Again, the Internet makes this easier! 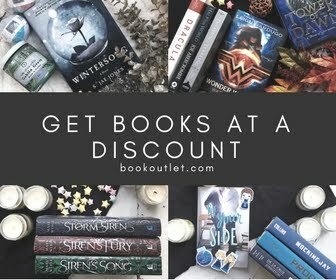 Do you like a bookstagrammer account? A goodreads reviewer? See what books they want to read and see if they want to buddy read. 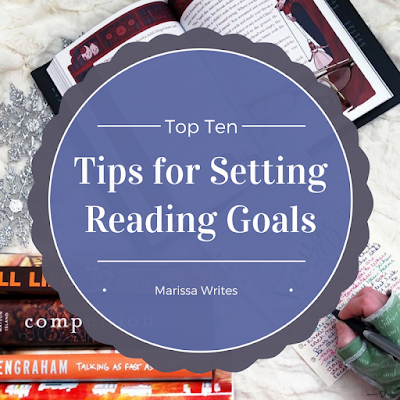 It's a super fun way to set goals and chat over those moments when you might just give up and not read. Visit your local library! Libraries exist because the community uses them, so search out yours. If you don't have one in your own town, try the next town over. Many libraries have vast digital libraries now, so you could borrow digital books, or audiobooks, and not even have to worry about going in all the time. But most libraries become bibliophiles favorite place... so put it down in your calendar to visit your library! Make sure it is fun! It is worth saying it again. Reading should be fun. Sure push yourself with a new genre, a new author, a new medium... but if you get 50 pages in, and simply do not like the book, then don't read it. I am a firm believer that once I read 100 pages, I consider the book "read" and simply shelf it in my DNF list on goodreads... I mean life is too short for books that don't engage us. And there are so many great options to try. If you don't like a book, no big deal. Don't feel guilty over it. And in case you are all dying to know, my official reading goal this year is 95 books - I hope to end up reading more, but I always set my goals lower. And I am hoping to partake in a few read-a-thons and challenges as they appear. I have decided to try the Unread Shelf Project - where you read the unread books on your own shelf first... and the TBR pile Challenge, where you read the books that have been sitting on your TBR for more than a year. Feel free to join in with either one if you want! What are your reading goals for 2018? 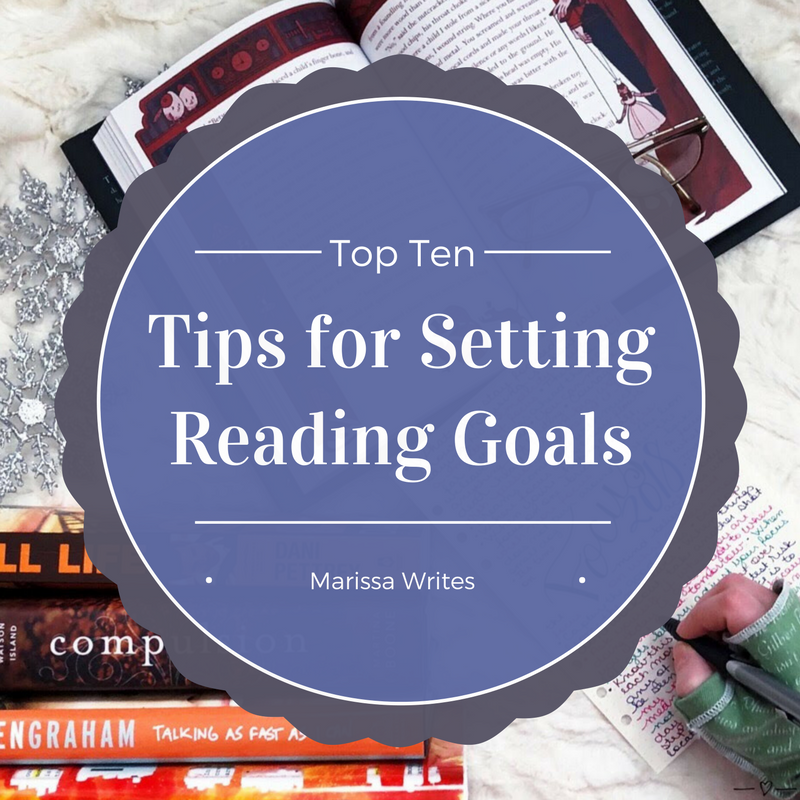 How do you stay motivated to reach your reading goals? Are you taking part in any specific challenges? I'd love to know about them! Love your idea for setting monthly goals! Somehow my brain is like - oh you'll read 60 books this year, for sure, but actually sitting down and doing the math of how many books that is a month, week, etc isn't as obvious to me lol, meeting a monthly goal would help me make sure I reach my year goal and adjust where needed. Thanks for the tips! I used to be the same way! Set yearly goals and then never break them up for the months... it's more manageable this way Good luck! Great tips! Mini-goals are an awesome idea. They have helped me immensely! These are great tips. 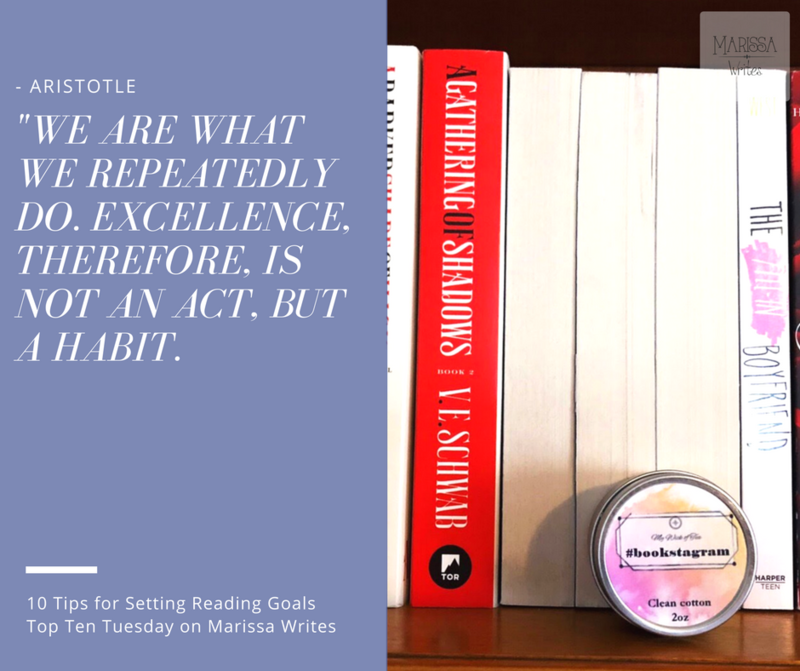 I am terrible at goal setting and keeping my bookish promises. 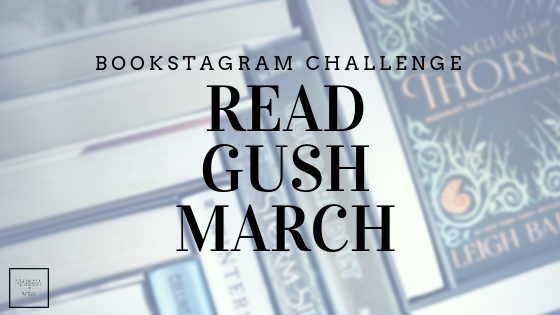 This year I only hope to read more from my physical TBR and master Bookstagram (or at least figure it out!). I love your take on today's topic - these are all great tips! Trying a different medium has really worked for me. I usually have one or two ebooks in progress, as well as physical books and sometimes even an audiobook. Then when I have time to read, I choose whichever format suits my mood. Way to go! I love when you can surpass goals like that! It is so motivating to read with a friend. And the conversations about the books are great... glad you enjoy reading with your friend. I love that you mentioned libraries. I get so many of my books from the library, mostly because I've run out of bookshelf space at the moment :) And with so many new books on their displays I always end up coming away with more books than I originally intended. Setting these small goals helps you capture the larger goals.